Of course, whether is is true depends on the lottery, on the demographics of participants in the lottery, on their method of transportation, the duration of transportation, and probably on other factors as well. However, if we take into account the age distribution of lottery participants, their method of transportation to the lottery, and statistics on the chance of winning the lottery (let's say a reasonably big prize), considering a developed, urbanised country, can we make any estimates whether this claim could be remotely true? Are the chances of dying each day 1 : 250 000? 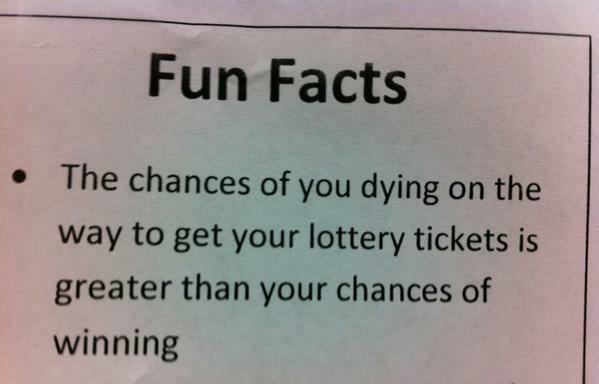 This looks to be plausible, at least for the UK National Lottery Jackpot. Not the answer you're looking for? Browse other questions tagged economics mortality gambling .